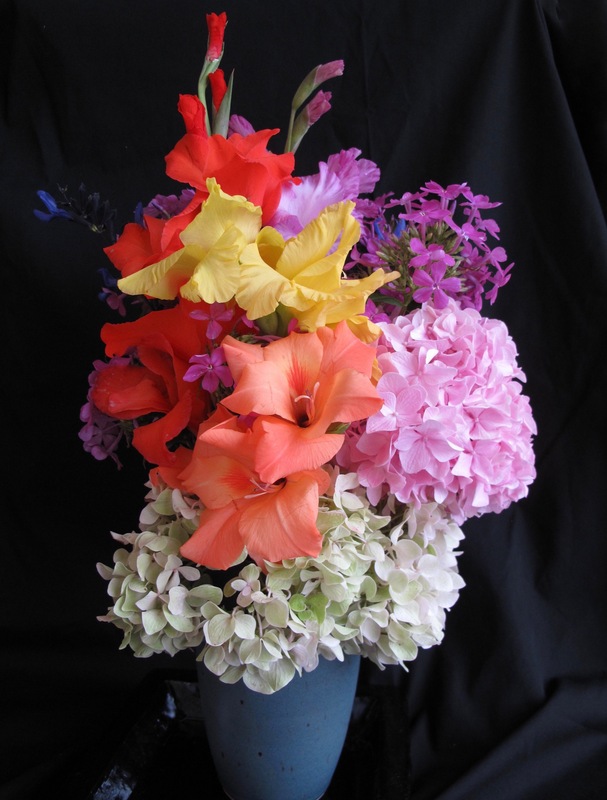 Lovely arrangements for your special day, I think I like the Hydrangea with the Gladiolus the best but they are all beautiful. I hope you and David have a happy celebration. I love your multi stemmed vases, I still haven’t found any but one day I will! Thanks Christina. Rain will dampen festivities around here today, but may still try to get out to a crafts and music festival nearby, raises money to protect the Eno River. It’s scorching here today but thunder storms are predicted for late afternoon. I love the gaudy ones best. But your vases are delightful. What a great playin session you had. Too many frilly flowers competing for attention and I couldn’t choose! Love the four, I think the Purple Coneflower is my favorite. Happy Fourth! Thanks, The coneflowers have been great this year. They often die back before I can worry about dead-heading but this year I’m going to try to keep them going. Hooray for the red, white & blue, toned down though they may be. Happy Independence Day! Thanks Ricki and Happy Fourth to you! Way to go, Susie. What a great idea. Happy 4th. Thanks John. Have good Fourth. I like that one too Cathy. I started out trying to put all these flowers together and it was chaos. Great idea, happy 4th of July! Thank you Anca! Hope you have a good week. You have done spectacular work Susie…..I love the overhead view of the shastas…and so much color through especially the glads! Thanks Donna. I never tire of the glads. Many more planted recently that are growing well so I expect there will be more colorful vases. Nice series – esp. 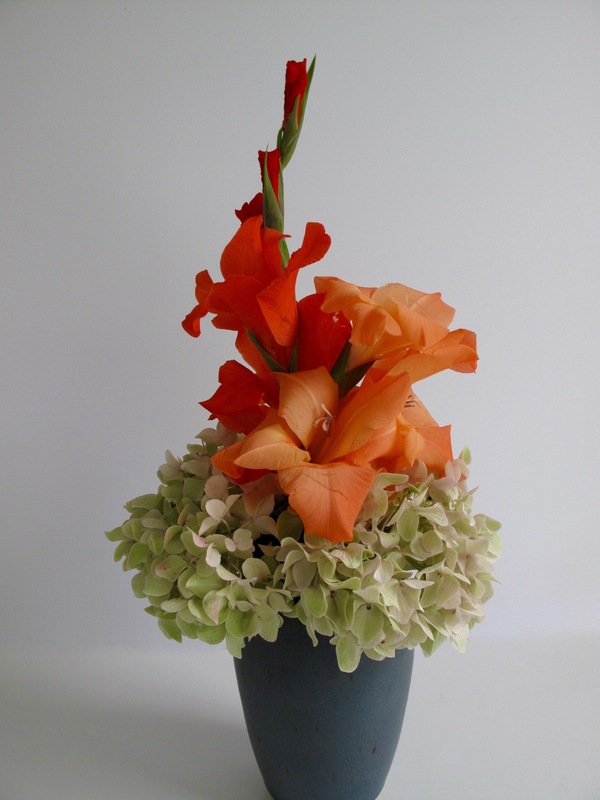 the coral glad/hydrangea combo – stunning! Thanks Eliza. For a couple of years I only grew coral glads and still a favorite. All the arrangements are glorious, Susie, although the third one may be my own favorite. I saw a vase very similar to your multi-stemmed one at a show recently and thought of you – you always make such good use of it. Best wishes for a very happy 4th! Happy 4th Kris. Was getting a little desperate when I reached for the multi-stemmed vase. It works wonders–a truly versatile container. Thanks Judy. Quantity over quality this week. I had cut so many flowers it made sense to keep trying to work things out. Nice collection of arrangements. I like the one with Purple Coneflowers best, perhaps because I can’t grow them any more. Thanks Jason. Will you ever be able to return to growing coneflowers. Is the issue in the soil or the plants available to you? It’s Aster Yellows. I suppose at some point I may try them again, though right now I have no space for them. How lovely they all are! 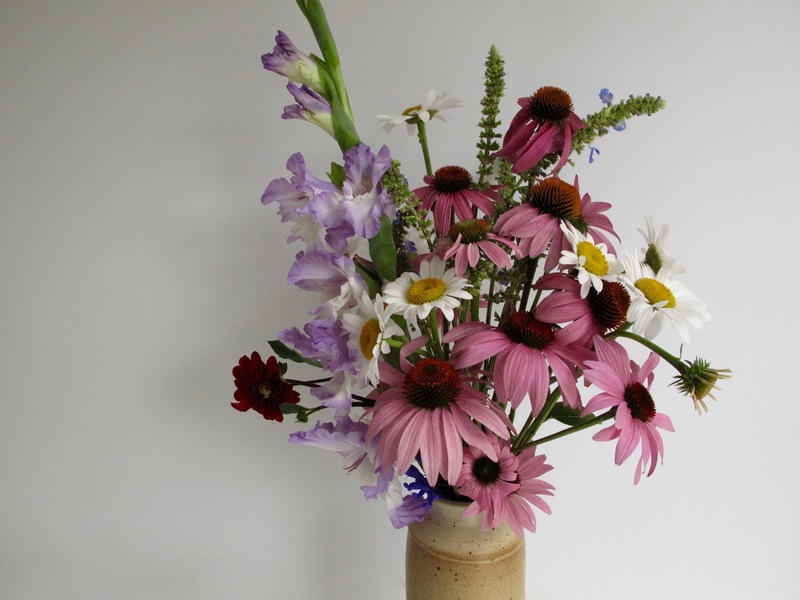 I especially love the shasta daisies in your multi-stemmed vase which I openly covet! 😉 Hope you had a happy 4th! I like that one too Cathy. I’ve seen that vase sold in a museum shop in other brighter colors and also in an all-white version, but I like the colors on mine best. They match almost any flower. Wow, you’ve been so busy. 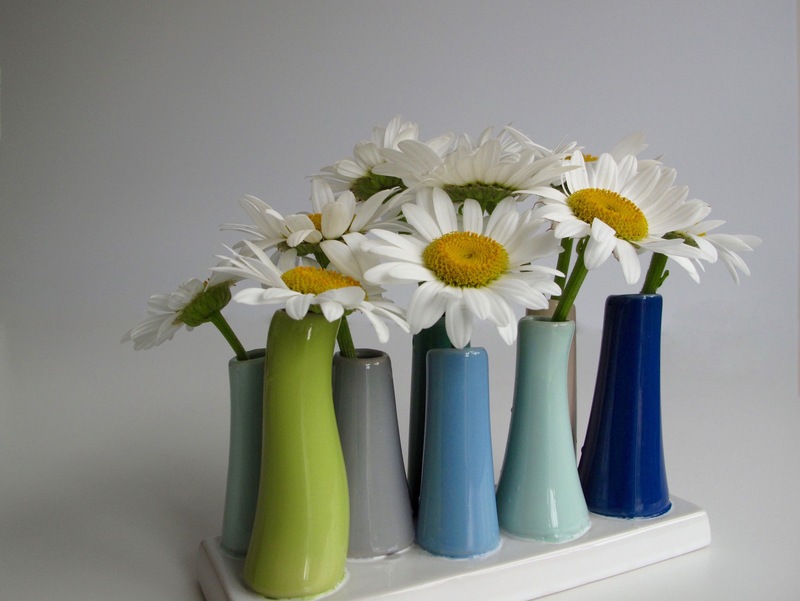 I love the daisies in their interesting individual vases and the colours and boldness of the second arrangement. Thank you. My daughter gave me that little multi-stemmed vase and it quickly became one of my favorites. I missed this on July 4 but really enjoyed finding it today. 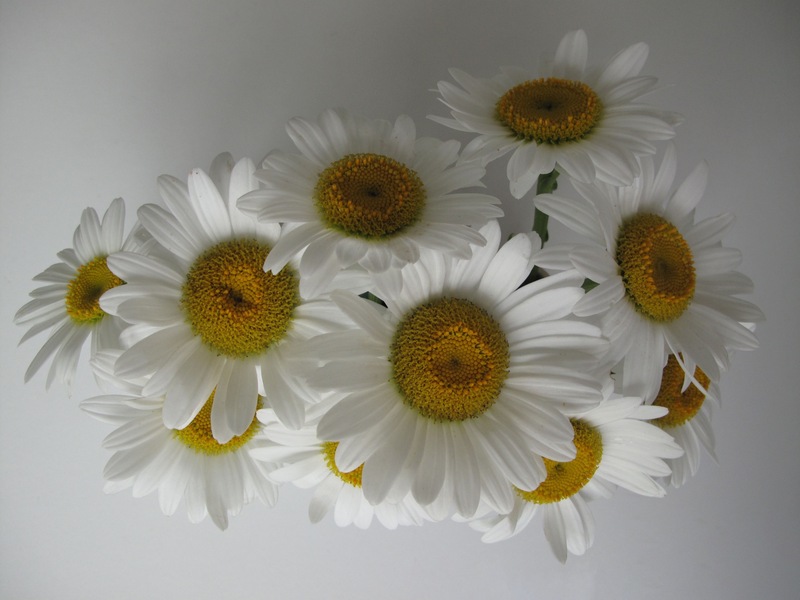 I love the daisies, always so cheery. Thanks Dorris. The daisies have lasted well this year because we’ve had plenty of rain.